I had the unexpected privilege last week of being invited to a House of Commons debate on the ethical impact of wearable technologies. The debate took place in Committee Room 10, was organised by The Debating Group and sponsored by CIPR. As a cardiologist with an interest in how these technologies are impacting wellbeing and healthcare, I was interested in how other professionals perceive these technologies. The motion was: Wearable Technology is an Ethical Nightmare for PR, Marketing and Communications Professionals. Stephen Davies argued in favour of the motion. Stephen Waddington opposed. Much to my surprise, the motion lost by an almost 2:1 vote. For me, the debate is really about how Big Data will impact the future, and the ethical challenges this presents ('The Data Dilemma'). As individuals we continuously produce unique datasets. How this data is captured and utilised will present huge opportunities and challenges in the future. Teasing apart this 'jungle of data streams' will not be straightforward. Supermarkets monitor our shopping habits and can predict our interest in health, our relationship status, whether or not we are trying to lose weight or get pregnant and so on. Internet search engines monitor our browsing habits and again predict our interests and activities. All this data has huge value but also the potential to cause harm if shared without our knowledge. In Japan, billboards are using facial recognition technology to target specific adverts to potential customers. As you board a flight, a flight attendant wearing Google Glass will know more about your various habits than the person you might be travelling with. There are huge benefits to be reaped from Big Data. There are also huge challenges, and in particular ethical challenges, to society and organisations harvesting this highly personal data. Continuous personal health data (generated by wearable tech) combined with genomic data (owned by organisations like 23andMe), and shopping habits could be used to accurately predict our future health. Is this information that we want to share without restriction? Clinicians are already using implantable technologies to monitor heart rhythms and predict the risk of cardiac arrest and/or stroke. Genetic and blood testing for cancers is commonplace. All of these present ethical challenges which clinicians deal with on a daily basis. As the amount of personal health data being captured and shared rises exponentially, the ethical challenges can only increase. One of the key questions will be: who owns our personal health data (see Maneesh Juneja's excellent blog)? To suggest that there will be no ethical nightmare seems shortsighted. Vinod Achan is a Consultant Cardiologist with an interest in Digital Health, Wearable Tech, and the ethical implications of Big Data. The photograph of me speaking at the debate was taken by Kate Matlock. The NHS is under a sustained attack both from media and government. I wrote about this a year ago (see here) and very little has changed. One effect of these attacks is to demoralise NHS staff who deliver an excellent service despite shrinking resources and falling pay. The other is to destroy public trust in the NHS. Both pave the way for a takeover of the NHS by alternative healthcare organisations. 1. The NHS delivers universal comprehensive healthcare. It delivers not just a basic acceptable standard of healthcare, but the best possible healthcare for everyone regardless of income. This means that when you fall ill, the NHS takes you in and does its best to fix you regardless of your income or employment status. A recent analysis by the Commonwealth Fund (see here) shows that contrary to media reports, the NHS ranks overall first amongst 11 other healthcare systems (and first or second in almost all categories including effective care, safe care, equal access, efficiency). All of this it achieves with the lowest expenditure per head of population (and lowest % GDP expenditure). 2. More equal access to healthcare improves healthcare outcomes. Life expectancy is worst in unequal societies. In the US, heart attack patients with no health insurance have a 30% higher chance of dying than someone who is insured (see here). 3. The NHS is the most cost efficient healthcare system in the world (apart from perhaps Cuba). Administration costs were 5% but are expected to approach 20% of the NHS budget as market forces dominate. Also the bargaining power of the NHS allows it to negotiate the best possible prices with industry. Privatisation of the NHS is NOT going to reduce healthcare costs as a % of GDP. 4. The NHS embraces effective, proven technologies and can implement them nationwide in a way that no other healthcare system can. Primary angioplasty (emergency coronary angioplasty and stenting) as a treatment for heart attacks is an excellent example of this. See here for details. 5. The NHS has always had an international reputation for training nurses, doctors and other healthcare professionals. Anyone who dismantles the NHS should not underestimate the effect this will have on training future nurses and doctors. The NHS faces serious financial challenges in the near future and is being portrayed in the media as an organisation on the verge of collapse. What is not emphasised is that the NHS provides effective universal healthcare at a much lower cost compared to other healthcare systems. The NHS budget for England is less than £70 billion. A challenge to save £20 billion from 2011 to 2014 was set by NHS England. Amazingly, the NHS responded with an underspend of £1.5 billion in 2012/13. Despite these increases in cost efficiency, huge challenges loom large for the NHS. Acute trusts in particular face hardship. The NHS is being ground down but there are many ways in which we might support the NHS during this period of austerity. The following are some suggestions that spring to mind. 1. Financial support for the NHS needs to increase, not shrink. Government spending on the English NHS is shrinking from 6.5% of total GDP (2009-10) to 6.2% (2015-16). 2. The continuous 'redisorganisation' of the NHS must stop. The estimated cost of disbanding PCTs and setting up CCGs as a result of the 2012 Health and Social Care Act was £1.5 billion. Integration and cooperation rather than competition needs to be the driver for change. Unless the NHS remains the preferred provider for most aspects of healthcare, time-consuming tendering processes and marketing campaigns are likely to increase not reduce costs (with the largest cost increases seen in administration and not clinical care). When profit making services are cherry picked by private providers, acute care (which struggles to make a profit) will face further hardship. 3. We must look at how we work with the pharmaceutical industry. The NHS drug bill exceeded £10 billion in 2013. A concerted campaign across the NHS to use the most cost effective drugs (and in particular generic rather than branded drugs)could save £1 billion, for example. The NHS needs to exploit its huge purchasing power (with hospitals and GP surgeries working together) to negotiate the lowest possible prices with big pharma. 4. We must address the PFI problem. PFIs (Private Finance Initiatives) are extortionate mortgages taken out to build hospitals. Approx 120 current NHS PFI projects have a capital value of £12bn but will eventually cost the NHS £79bn in repayments. Total annual PFI repayments in 2012/13 reached £1.8bn and will peak at £2.7bn in 2029/30. At least one hospital has collapsed because of crippling PFI debt. 5. We must harness the power of technology to our advantage. At present, contracts binding the NHS to single IT or technology vendors are expensive and fraught with risk when contracts end. Open source software and hardware designs which allow compatibility across the whole NHS should be standard requirements, for example. These are my five suggestions. What would you add to this list? Vinod Achan is a Consultant Cardiologist and the Clinical Lead for Primary Angioplasty at the Surrey Heart, Stroke and Vascular Centre, Frimley Park Hospital NHS Foundation Trust. At a time when NHS funding is being squeezed and both GP (primary care) and hospital services are coming under huge pressure, it is worth looking at a comparison of healthcare systems in the UK, US and France. While France enjoys a slightly longer life expectancy than the UK, it spends 12.5% of its GDP on healthcare (£3000 per head) compared to 9.4% (£2190 per head) in the UK. France has 6.4 hospital beds per 1000 of the population (of which 65% are privately funded) compared to 3 beds per 1000 in the UK (where only 15% of beds are privately funded). 49% of French doctors are GPs compared to 30% of UK doctors. In stark comparison, the US (whose healthcare system we risk emulating) has the shortest life expectancy despite spending 17.2% of its GDP on healthcare. Only 12.3% of US doctors are GPs. A solution to the current NHS crisis will require many approaches. Ongoing disruption of the world's most cost efficient health service increases healthcare costs. Administrative costs now account for 30% of NHS spending. Some of that spending needs to be clawed back and spent on the frontline. An urgent priority now is to support and strengthen GPs who form the backbone of the NHS. Sir Ian Kennedy QC spoke on 'Reshaping the NHS' at yesterday's annual general meeting of the British Fulbright Scholar's Association, held at the very impressive Two Temple Place. Sir Ian is the Emeritus Professor of Health Law, Ethics and Policy at UCL, an Honorary Fellow of the Royal College of Physicians, and Vice Chair of the College of Medicine. He previously chaired the public inquiry into paediatric cardiac surgery at the Bristol Royal Infirmary, and was chair of the Healthcare Commission from 2003 to 2009 (before it became the CQC). Eminent Fulbrighters in the audience included Prof John Lazarus and the amazing Katharine Whitehorn. Sir Ian spoke of the differences between changes in NHS structure and culture. He described the NHS as 'a moral enterprise, short on reflection and enterprise'. Ultimately our devotion to the NHS boiled down to two things: Do we love our neighbour? And how much? Had the NHS run its course? Of course not, he said. But he did raise two questions, both difficult to answer: Where should the money come from? What should we spend it on? He drew from his vast experience of public inquiry into healthcare disasters to describe anecdotes of appalling behaviour by healthcare professionals, often a result of system failures. Sadly for me, he did not highlight the many wonderful achievements of the NHS, most importantly the delivery of universal and comprehensive healthcare, free at the point of delivery (1). When asked what the NHS could be proud of, he hesitated. He might have quoted Prof Don Berwick, Harvard Prof turned UK Health Tsar, who on the NHS' 60th birthday described it as 'one of the astounding human endeavours of modern times' (2). For my summary on Don Berwick and the NHS, see here. There was much in Sir Ian's lecture that I found useful. He emphasised the importance of Service in the NHS, and talked about developing 'a culture of service'. The key to this, he emphasised, was STRONG LEADERSHIP. How do we persuade NHS leaders to stay in post for longer (the average lifespan of an NHS CEO is 2 years)? We need leaders in all sectors of the NHS, leaders amongst the cleaners, the porters, and so on, as well as doctors and nurses. How do we identify and develop these leaders? He spoke of the three hallmarks of good leadership: having a vision, communicating that vision, and living the vision. For a short video on how NHS leadership at my own NHS trust is winning national awards, see here. Sir Ian talked about putting the patient at the centre of everything. VERY IMPORTANT. Employee engagement, he also said, is the best indicator of quality of service. Sir Ian's talk was informative, entertaining, well received and provoked vigorous debate. The Commonwealth Fund data (3) was discussed briefly. During the Q and A, I spoke of my own experience of how the NHS has rapidly adopted new approaches to emergency heart attack treatment (4). I think it's fair to say that by the end of the evening in that wonderful venue, we all learnt something new about how the NHS can and will improve further. Vinod Achan is a Consultant Cardiologist and the Clinical Lead for Primary Angioplasty at the Surrey Heart, Stroke and Vascular Centre, Frimley Park Hospital NHS Foundation Trust. Frimley Park Hospital NHS Foundation Trust is an award winning 24/7 regional Heart Attack Centre, performing over 1000 coronary angioplasties a year and delivering emergency cardiac care to a population of one million people. A recent article in the Guardian implies that the treatment of heart attacks outside working hours is below an acceptable standard. It suggests that "the principle of 'office hours only' applies as much to emergency medicine as it does to your local fishmongers". The article quotes a meta-analysis of heart attack patients published in the British Medical Journal. 48 studies published between 2001 and 2013 were pooled for analysis. Most data was old (pre-2005 and some even from the 1990s) and only two studies looked at UK patients. The researchers 'concluded' that worldwide mortality rates for heart attacks (STEMIs) were higher outside normal working hours (and that North Americans fared better). How does this data apply to the treatment of heart attacks in the UK now? For details on how we treat heart attacks in the UK see my earlier blog here. The majority of STEMI patients in the UK are now treated by primary angioplasty, the gold standard of heart attack treatment, and the speed with which this has been successfully implemented is shown by this graph. ALL patients in the UK regardless of their background, location, age and clinical condition receive an equal and excellent standard of heart attack care 24 hours a day, 7 days a week, and delivered by a consultant. A network of designated 24/7 regional heart attack centres in the UK ensures that ALL patients get the appropriate treatment as soon as possible (and yes, to all those outside the UK, it is free at the point of delivery!). This is ONLY possible because the NHS delivers truly universal healthcare across the country and NHS ambulances work closely with NHS heart attack centres 24/7 to deliver the best care for patients. All this data is very carefully audited and available to the general public. The MINAP (Myocardial Infarction National Audit Project) 2014 report is available here. BCIS, the British Cardiovascular Intervention Society, produces annual public reports (see here). Again the UK is unique in the way it audits and publishes data of ALL interventional cardiology units. The general public in the UK should know that if they have a heart attack, they will receive the best possible care (at the very highest of international standards) 24 hours a day, 7 days a week. Any suggestion in the media to the contrary is misleading at best and scaremongering at worst. The human heart pumps six litres of blood per minute around the body for an entire lifetime (and up to 18 litres per minute during exercise and pregnancy), maintaining the delivery of oxygen and nutrients to all body tissues. Three (and in some people, four) major coronary arteries (running on the surface of the heart) supply blood to the heart muscle and slowly narrow with age due to the accumulation of fat and inflammatory cells in the wall. This process known as atherosclerosis is accelerated by smoking, diabetes, high blood pressure and high cholesterol levels. As the arteries narrow beyond 60%, blood flow to the heart muscle is restricted during exercise and can produce symptoms of stable angina during physical activity. In most people, this is a central chest discomfort (described as a weight on the chest or a tight band across the chest) radiating to the shoulders and/or neck and associated with shortness of breath. Others may only experience breathlessness, jaw pain or upper back discomfort. These symptoms typically resolve with rest. Occasionally there may be no warning symptoms whatsoever. A complete blockage of a coronary artery results in a heart attack which is potentially fatal. Heart attacks are the most common cause of death in the developed world and the risk of death following a heart attack is 40% if untreated. The symptoms of a heart attack are the same as those described above but more severe and typically associated with sweating, feeling faint, vomiting and sometimes collapse. Interestingly, 25% of heart attacks do not produce any recognizable symptoms or are ‘silent’. How do we treat Heart Attacks? Thirty years ago, heart attack patients would spend at least two weeks in hospital and, with no specific treatment available, the probability of leaving hospital (having survived the initial attack) was only 80%. 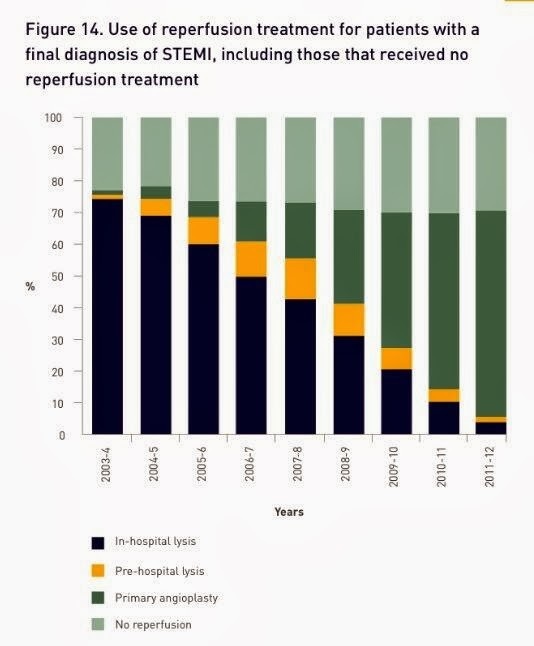 Over the last thirty years, ‘clot busting’ drugs improved survival rates to 90% but patients spent a week in hospital, often suffered significant muscle damage and often developed heart failure. Now there is substantial evidence that the best treatment for heart attack patients is an emergency (or primary) coronary angioplasty delivered as quickly as possible. An interventional cardiologist, with the help of his or her team, performs an angiogram by passing a narrow plastic tube (called a catheter) into the circulation (through a small tube in the groin or wrist) and to the heart, obtaining detailed x-ray images of the coronary arteries. The artery responsible for the heart attack is then identified and reopened with a fine wire, balloon and a stent (a wire mesh tube to keep the artery open). Other devices to aspirate clot from the arteries may also be used in conjunction with drugs injected directly into the blocked artery. Survival rates are greater than 96% and patients leave hospital after two or three days with a lower risk of heart failure. Heart attacks require emergency treatment and delays can result in death. At designated ‘24/7’ regional heart attack centres like Frimley Park NHS Foundation Trust, we have a ‘Door to Balloon’ target (namely, the time between the patient entering the hospital via ambulance or helicopter and having their blocked artery reopened) of 60 minutes (and in practise we average 40 minutes). What should I do if I think I have Angina? When symptoms are stable, in other words symptoms develop with activity but resolve with rest, urgent advice should be sought from your GP and then a cardiologist. Your cardiologist will arrange a treadmill test, an ultrasound study of your heart and possibly an angiogram before deciding on the best treatment for you. Symptoms developing at rest should be regarded as ‘unstable’ and treated as urgently as possible. The ideal situation would be to avoid a heart problem altogether. Avoiding cigarettes, regular moderate exercise, weight control, blood pressure control and a healthy diet (in particular avoiding sugar and controlling fat intake) can help reduce your risk of developing heart problems. However a number of unidentified factors (including genetic factors) mean that no one is immune from heart disease and symptoms should always be taken seriously.